Dyson has been working on robotics with Imperial's Prof Andrew Davison since 2005, and he will run the new lab. Sir James Dyson said: "My generation believed the world would be overrun by robots by the year 2014. We now have the mechanical and electronic capabilities, but robots still lack understanding - seeing and thinking in the way we do. In 2001, Dyson's prototype robotic vacuum cleaner - the DC06 - nearly made it into production, but Sir James pulled the product saying it was too heavy and expensive. 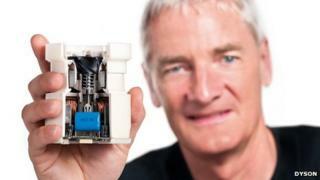 The five-year investment, supplemented by an additional £3m of match-funding from other sources, will pay for 15 scientists, including some of Dyson's own engineers, the company said. Prof Davison, currently head of robot vision at Imperial's department of computing, is an expert in Simultaneous Localisation and Mapping (SLAM) systems using a single camera. He said: "A truly intelligent domestic robot needs to complete complex everyday tasks while adapting to a constantly changing environment. "We will research and develop systems that allow machines to both understand and perceive their surroundings - using vision to achieve it." In January, Dyson announced a £250m investment to double the size of its research centre in Wiltshire and hire 3,000 more engineers. The company said it had "drawn up a blueprint" for the largest expansion in its 20-year history. The plans include a new technology research and development campus but are still subject to planning permission.